Composed by Franz Liszt (1811-1886). Masterworks; Piano Collection. Dover Edition. Classical Period. Collection. With standard notation (does not include words to the songs). 217 pages. Dover Publications #06-247449. Published by Dover Publications (AP.6-247449). ISBN 0486247449. 8.38x11.14 inches. English. 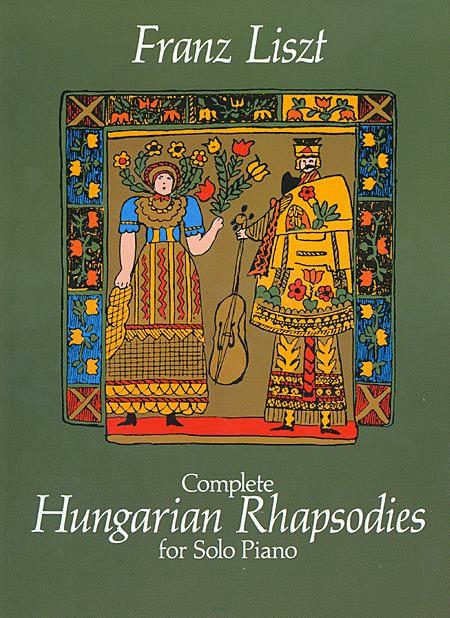 Reprinted from an authoritative Russian edition of Liszt's works are all 19 Hungarian Rhapsodies in a clear, easy-to-read edition. 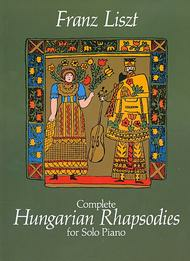 Published in association with the American Liszt Society. , and would recommend them to any pianist. An affordable and good quality Schirmer edition of these works exists under the name "Rhapsodies Hongroises" Get that instead. Not the clearest edition, but the pianist I bought it for was delighted and satisfied. 17 of 46 people found this review helpful. small. not to mention a horrible printing job. don't let the low price fool you because you get what you pay for. notes are incredibly small and the book does not lay flat... the pages are also extremely thin. Get the C.F. Peters editions, they are expensive, but well worth the price. Rule #1: never buy music books from Schirmer or Dover!!!! the piano, and I am 15 years old! I really do love these pieces, but do not care for the edition. Think twice before purchasing. I do not feel it is worth the money. Oh, and the cover art is disturbing too.